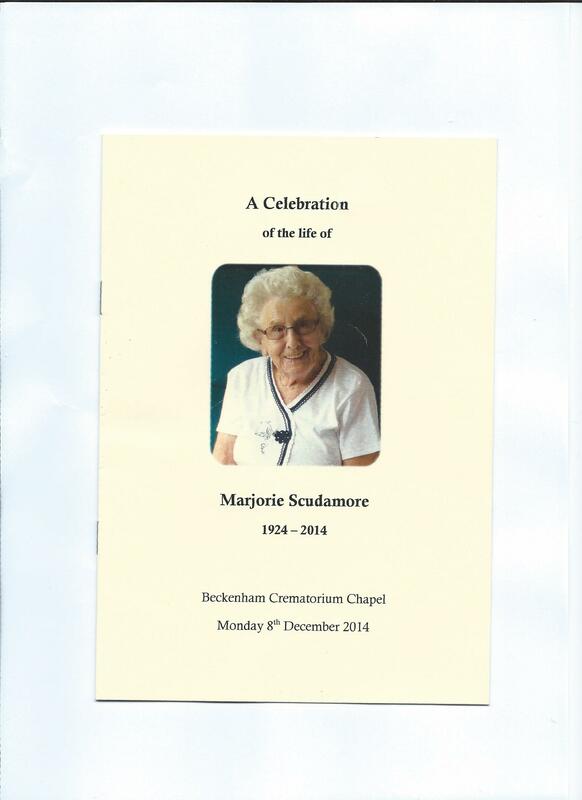 I sadly attended the funeral of a dear friend, Madge, yesterday 8th December 2014. She was certainly well loved, as was proven by the many friends who were there – well, who wasn’t there? 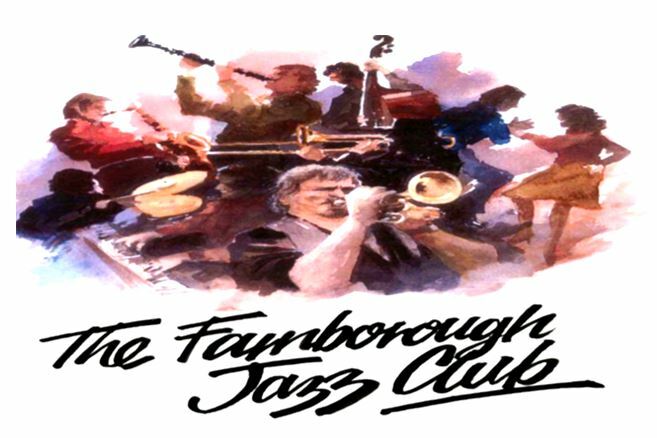 Family, friends, especially friends from the Jazz world, many of them musicians. They came from far and wide to give her the send-off, she so deserved. Colin and Teresa (her son and daughter-in-law), must be proud of themselves for their efforts in making sure everything went so smoothly and to include Madge’s wishes. 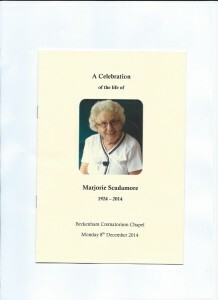 Madge (who was 90 last July) had wanted to have a happy send-off, to include her jazz. That lovely song “Welcome to My World” by Jim Reeves, was played to welcome everyone and The Reverend Jonathan Ward (Rector of The Church of St. John the Baptist, West Wickham) gave a welcome and introduction. Madge had chosen the hymn “All Things Bright and Beautiful”, with Psalm 23 being read. The Reverend read out Colin’s eulogy (obviously much too hard for Colin to do). Also “The Old Rugged Cross” was played, plus the hymn “Amazing Grace” and the music to send us home was “Hello Central, Give Me Doctor Jazz”♫. Afterwards, most of us went to The Swan, West Wickham, where it was lovely to see photos of her life displayed and on the two TV’s. So sad, but so wonderful. Some of you know Madge ran her own jazz club for many years and had devoted so much of her time to jazz, spreading her smile around wherever she went. Colin’s eulogy included the word ‘Gutsy’, a word I have used for her for many years. I know what traumas she had to go through with being widowed and then to lose a son (we ran parallel), but she never made people feel awkward. Well, you only have to look at Colin and the way he has turned out, to see what kind of a person she was (we all know Colin is lovely). It was sad for us not to see her walk in to the club, because even though her eyesight was going, she still made every effort to come. So when she stopped, you knew she could hardly see at all. Then in those last few months, when she knew the cancer was going to beat her, she didn’t want any more treatment. Madge said she was ready for whatever time she had left AND STILL SHE HAD A LAUGH AND A JOKE – What a woman! I’m sure you will all miss her lengthy long phone calls (the telephone companies will go bust) and the many laughs shared, with her jokes. One of my many wonderful memories of Madge, was when she went to Thailand ON HER OWN (that was when I began referring to her as gutsy). I asked her to bring back a Thai’ boy for me and her answer was “I’m bringing back two, but they are both for me!” She was in her eighties then AND I can still hear her infectious cheeky laughter now. The jazz world will miss her big time, but I bet she is already making herself busy up in the big blue yonder (including telling her many jokes too) aye? Luv Diane (someone who is proud to have been Madge’s friend) and Keith is included there, of course.